It took me years to find the courage to speak to Luka. He seemed exactly like me. Intelligent. Focused. Serious. But he’s not the man I imagined. Not for sale on Amazon. Smashwords is Kindle compatible. Vasilije Markovic is the prince of the Serbian mafia and one of the most powerful men in Chicago. His smile may be razor sharp, but he's crueler than the devil. I'm playing a dangerous game and betting my life I'm going to win. I pretend to be his pawn. I do as he says and move where he tells me, letting him think he's in control as I position myself for revenge. Every turn brings us closer. His grin doesn't seem as evil when we're alone. Behind closed doors, I welcome his unrelenting and vicious personality. He's confessed all his secrets, but I'm holding one back and it's a game changer. 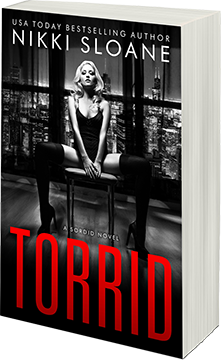 For the first time ever, the too-hot Sordid series is available everywhere as a set. Meet the seductive and dangerous Markovic brothers and the women who bring them to their knees. Contains SORDID and TORRID, a duet of dark romance.